It is currently highly recommended to use the Devel branch, a formal release is expected soon (iTaSC DSL and stacks). Please post remarks, bug reports, suggestions, feature requests, or patches on the orocos users/dev forum/mailinglist. iTaSC stands for instantaneous Task Specification using Constraints, which is developed at the K.U.Leuven during the past years [1,2,5]. 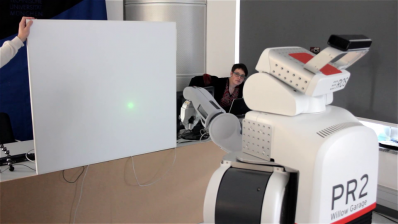 The framework generates motions by specifying constraints in geometric, dynamic or sensor-space between the robots and their environment. These motion specifications constrain the relationships between objects (object frames) and their features (feature frames). Established robot motion specification formalisms such as the Operational Space Approach , the Task Function Approach , the Task Frame Formalism , Cartesian Space control, and Joint Space control are special cases of iTaSC and can be specified using the generic iTaSC methodology. 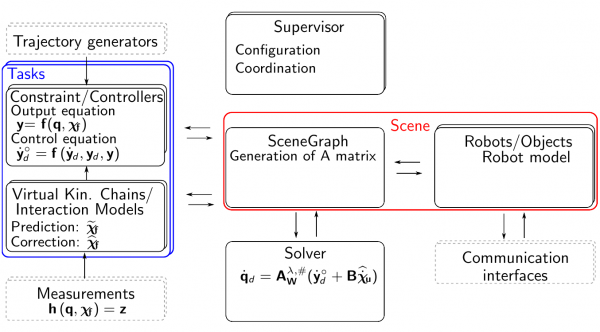 automatic derivation of the control solution: the iTaSC methodology generates a robot motion that optimizes the constraints by automatically deriving the controllers from that constraint specification. weights and priorities: different constraints can be weighted or given priorities. These advantages imply that the framework can be used for any robotic system, with a wide variety of sensors. In order not to be limited to one single instantaneous motion specification, several iTaSC specifications can be glued together via a so-called Skill that coordinates the execution of multiple iTaSCs, and configures their parameters. Consequently, the framework separates the continuous level of motion specification from the discrete level of coordination and configuration. One skill coordinates a limited set of constraints, that together form a functional motion. Finite State Machines implement the skill functionality. This framework is implemented in the iTaSC software. O. Khatib. The operational space formulation in robot manipulator control. In Proceedings of the 15th International Symposium on Industrial Robots, pages 165–172, Tokyo, Japan, 1985. M. T. Mason. Compliance and force control for computer controlled manipulators. IEEE Transactions on Systems, Man, and Cybernetics, SMC-11(6):418–432, 1981. J. Rutgeerts. Constraint-based task specification and estimation for sensor-based robot tasks in the presence of geometric uncertainty. PhD thesis, Department of Mechanical Engineering, Katholieke Universiteit Leuven, Belgium, 2007. C. Samson, M. Le Borgne, and B. Espiau. 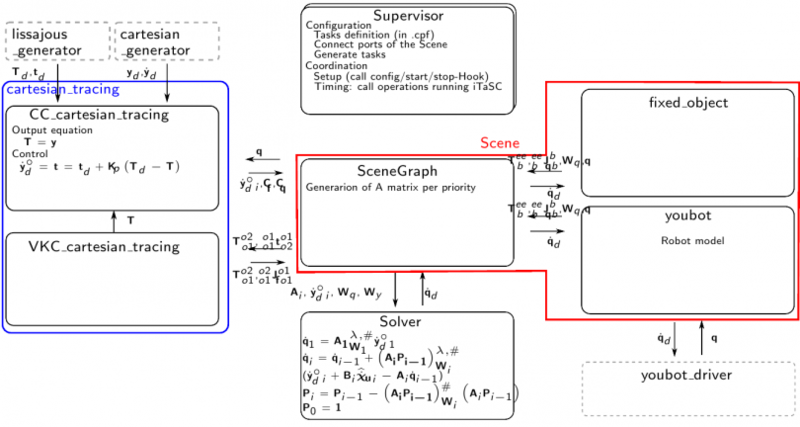 Robot Control, the Task Function Approach. Clarendon Press, Oxford, England, 1991. The iTaSC main manual is currently in pdf version, until the wiki version is finished. Event driven: Events trigger the FSMs to transition from one state to another. Each FSM should be designed such that it is framework independent (e.g. from OROCOS RTT). Each FSM is loaded in a Supervisor component, that contains the OROCOS (RTT) specific parts of the FSM. 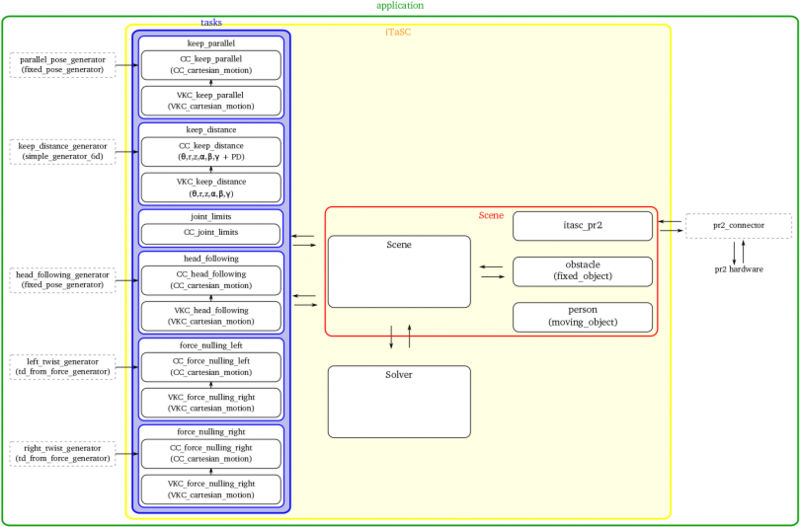 Application: The state machine of this level takes care of the behavior of the whole system: it configures and coordinates components not part of iTaSC (e.g. hardware interfaces and trajectory generators) and iTaSC as one composite component. The application developer takes care of the first part and sends (the fixed set of) events to configure and coordinate the iTaSC composite component. The transitions of the application state machine are always triggered by the a “done” signal raised by the iTaSC FSM (i.e. “e_ITASCConfigured” event, see 1.4) and additionally by user defined events that are raised by non-iTaSC components (i.e. hardware ready). iTaSC: The state machine of this level configures and coordinates the behavior of iTaSC components. It has a fixed structure, leaving two parts to be specified by the application developer ("user"). Firstly, the user must specify the description of the scene and the composition of the kinematic loops in the configuration file (“itasc_configuration.lua”). This file DOES NOT describe the actual behavior of the task but the components which are involved (Composition). Secondly, the subFSM part of the running state must be defined. The running state of the state machine is composed by two parts: the first coordination part is fixed and takes care of running all iTaSC components in the right order (actually making iTaSC components running as a composite component, from the user perspective), the second, the subFSM part (highlighted in green in fig The 3 FSM levels), specifies the high level workflow of the task. 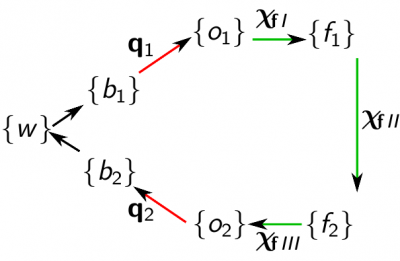 This second sub-state machine defines the transitions between the tasks. Task: The state machine of this level contains a more concrete coordination of the task: while the previous level abstracts from task specifics, here, the actual triggers to change the characteristics of the iTaSC components must be implemented (i.e. assignment of property values, etc.) see 1.5 for an example. These levels are not only present on the configuration/coordination but also on the computational level (see slides). As hinted before your application FSM will only 'see' the components 'outside' iTaSC (robot drivers, sensor components...) and iTaSC as one composite component. Similarly, the iTaSC FSM 'sees' a task as one entity. Section 'The sub-FSMs of the running state', gives a good example/effect of this distinction. As a result of the 3 levels, your application is always in 3 states: one for each level. running_taskname_coordination.lua: This is the coordination part of the running state ensuring that the iTaSC algorithm is executed in the right order. running_taskname_fsm.lua: This is the sub-FSM part of the running state. This part should be edited to implement the behavior of the running application. On the iTaSC level, composite_task_fsm.lua is used instead of running_itasc_fsm.lua, to highlight its meaning. There is also an additional file: itasc_configuration.lua, which is part of the configuration state of the itasc_fsm.lua. emergency state: an 'e_emergency' event is fired by one of the FSMs or components, in case of a failure. This event is caught by all state machines, causing them to transition to the emergency state, leaving whatever state the NONemergency sub state machine is in. This structure can be found in all statemachines of all levels (except for the application FSM, where the division of the running state is not (always) necessary). In order to get your application running, the application has to be configured and started. After running, you also want it to stop (. Moreover, these actions should happen in a coordinated way. the application level FSM transitions to the configuring state, after initialization. In this state, all application level components are configured and an event is sent ("e_configITASC"), to which the iTaSC level FSM will react by transitioning to the configuring state. The iTaSC level FSM, now in its configuring state, will on his turn configure the iTaSC level components and send an event ("e_configTasks") that triggers the tasks to get to the configuring state. the task level FSMs (also in the configuring state now) on their turn will configure the task level components. After successful completion, the task level FSMs will transition to the configured state and send out an event to acknowledge this completion of the configuration. When all tasks and iTaSC level components indicated a successful configuration, the iTaSC level FSM will transition to the configured state and send out an "e_ITASCConfigured" event. When all application level components indicate a successful configuration and this "e_ITASCConfigured" event is received, the application level FSM will transition to the application configured state. After an event triggering the transition of the application level FSM from the configured state to the starting state (in the most examples, just an e_done = completion of the configured state actions), a similar event-transition flow follows for the starting-started states. The flow for the stopping-stopped states is also similar. The running states are different in the sense that there is no 'ran state': the state machines will stay in the running state until they are stopped. The actual behavior of the application at runtime, is governed by the sub state machines of the running states of each level, which form a hierarchical state machine. The idea is that a high(er) level description is implemented in the composite_task_fsm.lua. 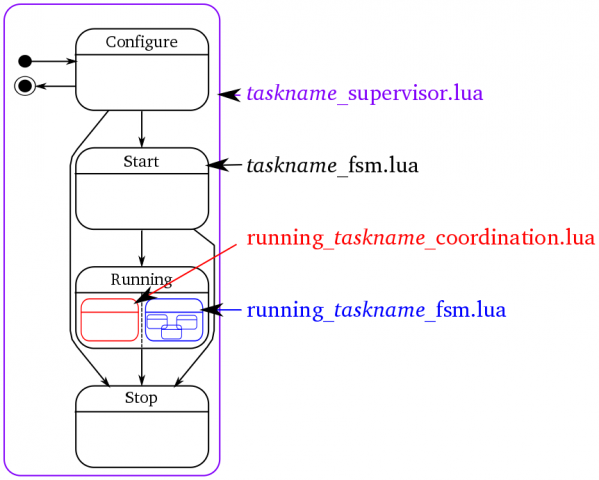 The actual behavior of the individual tasks is governed by a separate sub-state machine for each task, running_taskname_fsm.lua. 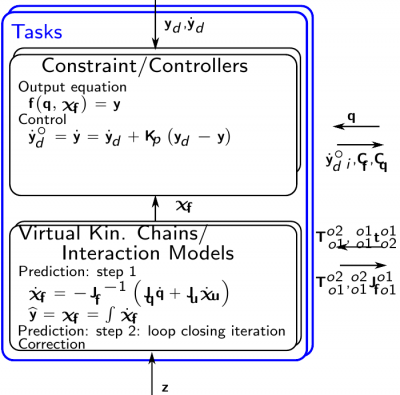 In other words: the composite_task_fsm coordinates the behavior between the different tasks. The running_taskname_fsm coordinates the behavior of the task. Trace a sine on a table, if no barrel is detected. In the figure, a (sub-)FSM is represented by a purple rounded box, a state by a rounded black box and a possible state transition by an arrow. State transitions are triggered by an event or combination of events. 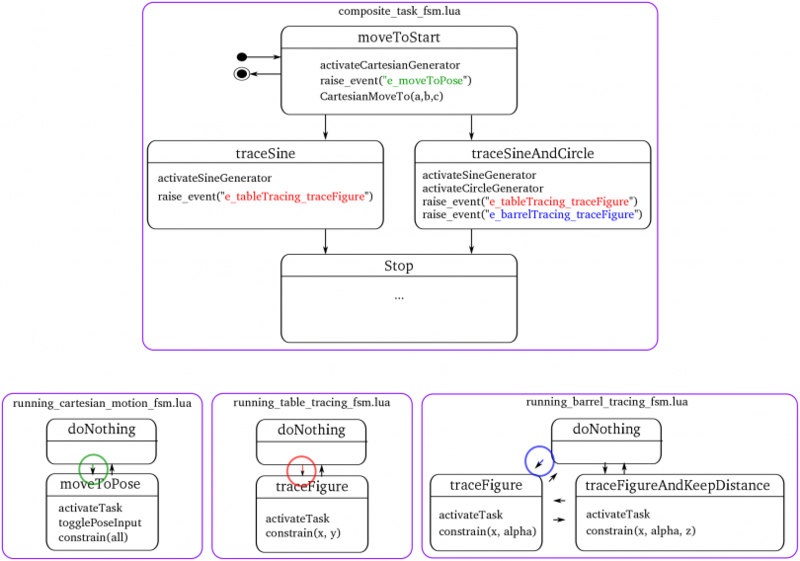 The state transitions of the task subFSMs, indicated by a colored arrow and circle, are caused by the event with the corresponding color, fired in the composite_task_fsm.lua. The composite state of the example in the figure consists of 4 states. and then calls the Lua function "CartesianMoveTo()", which is implemented in the itasc_supervisor.lua (no RTT specifics in the statemachine, remember!). send an event that causes the running_table_tracing_fsm.lua subFSM of the table_tracing task (and running_barrel_tracing_fsm.lua subFSM of the barrel_tracing task) to transition to a traceFigure state. After completion of the tracing task (or another stop-transition causing event), the composite state machine will reach a stop(ped) state. As can be seen, the composite task FSM just sends an event to trigger the task subFSMs to reach the appropriate state. The task subFSM will take care of task specific behavior, e.g. Doing so, the tasks can be easily adapted/ swapped/ changed/ downloaded. Note: The names of the tasks are specific; i.e. they are the names of the components that are used for the tasks. The name of the task package will be more general, e.g. xyPhiThetaPsiZ_PID task (named after the structure of it's VKC and controller type). Cfr. class - object of object oriented programming. Trigger events: events that trigger other state machines or components, typically used to ensure an algorithm distributed over multiple FSM is executed during the correct time step and in the right order, e.g. "e_triggerTasks", fired by running_itasc_coordination.lua. For conformity it is advised to use lower case names with underscores to separate words. Should inherit from SubRobot.hpp, which can be found in the itasc_core. This file is a template for a robot or object component. See itasc_robots_objects stack for examples. Coming soon, have a look at itasc_solvers for examples. This tutorial explains how to create an application to trace a Lissajous figure with a Kuka Youbot, starting from existing packages (itasc_core, robots, tasks, solvers, trajectory generators...). The code was developed by the Leuven team during the BRICS research camp 2011.
youbot_description package of the youbot-ros-pkg (=a stack), no need to compile it! WARNING: there are two repos around, make sure you have this one! The tutorial will follow the design workflow as explained here. X_fII=in this case actually the full pose! This will afterwards be implemented in the composite_task_fsm.lua and the running_cartesian_tracing_fsm.lua files. Consult 'subFSM's of the running state' of the iTaSC user guide for more information. The following figure depicts the behavior of this application. Templates of these files can be found in the cartesian_motion package, scripts subdirectory (cartesian_tracing is an instance of cartesian_motion). The actual FSM is loaded in the cartesian_tracing_supervisor component (which is written in the lua language, hence the .lua file). Since you'll (probably) need to add functions to execute RTT specific code in the running_cartesian_tracing_fsm, make a copy of this file to your scripts subdirectory of the package you have created for this application. Leave it for now. The FSM for this application consists of multiple files on different locations, the cartesian_tracing_supervisor has properties that contain the path to these files. Create a property file (cartesian_tracing_supervisor.cpf for example) in your scripts subdirectory of the package you have created for this application and edit these properties. There is no timer_id_property for task supervisors, because tasks are triggered by the iTaSC level by events. itasc_configuration: this file contains the description of the scene and the composition of the kinematic loops. Templates of these files can be found in the itasc_core package, scripts subdirectory. itasc_configuration.lua: this file has to be edited (application dependent),copy this file to the scripts subdirectory of the package you have created for this application. Edit the itasc_configuration.lua file you just have copied: define the scene and kinematic loops as depicted in the figures of the first steps of this tutorial. Look at the comments in the template for more information on the syntax. The actual FSM is loaded in the itasc_supervisor component (which is written in the lua language, hence the .lua file). Since you'll (probably) need to add functions to execute RTT specific code in the composite_task_fsm, make a copy of this file to your scripts subdirectory of the package you have created for this application. Leave it for now. The FSM for this application consists of multiple files on different locations, the itasc_supervisor has properties that contain the path to these files. Create a property file (.cpf) in your scripts subdirectory of the package you have created for this application and edit these properties. The itasc_supervisor and application_supervisor have a property "application_timer_id": make sure these have the same value. Take in this case eg. 1. The timer id makes sure that both components are triggered by the same timer. application_fsm.lua: this is the actual FSM. A template of this file can be found in the itasc_core package, scripts subdirectory. application_fsm.lua: this file has to be edited (application dependent), copy this file to the scripts subdirectory of the package you have created for this application. The application FSM is loaded in the application_supervisor component (which is written in the lua language, hence the .lua file). Since you'll (probably) need to add functions to execute RTT specific code in the application_fsm, make a copy of this file to your scripts subdirectory of the package you have created for this application. Check the functions called in the application_fsm and verify that the right rtt specific code is present in the application_supervisor, e.g. configureTrajectoryGenerators(), an example can be found in the template file itself. Add new functions for application specifics: the idea is to put a function in the FSM and the implementation with the RTT specifics in the supervisor. Make sure that you configure, start, stop (and cleanup) all application level components in this state machine! The FSM for this application can be on different locations, the application_supervisor has properties that contain the path to these file. Create a property file (application_supervisor.cpf) in your scripts subdirectory of the package you have created for this application and edit these properties. The itasc_supervisor and application_supervisor have a property "application_timer_id": make sure these have the same value. Take in this case eg. 1. The timer id makes sure that both components are triggered by the same timer. The following subsections explain which property files (.cpf files) to edit. The explanation on how to create such a .cpf file can be found in the orocos component builder's manual. An alternative is to deploy your component and write the properties with their current values to a file. Then adapt the values in this file. This alternative way allows you to create a cpf file, without learning the xml syntax. leave the other properties as they are (all elements of W=1, joint names of the arm count up from 1 till 4, the joint names of the base are baseTransX, baseTransY, baseRotZ, in this order). All feature coordinates have the same weight: put all elements of W to 1. Tune the control values: Kp (put 2 for all for now). We want to use velocity feed-forward: put all elements of Kff to 1. The application has two trajectory generators: cartesian_generator and lissajous_generator. Create for both a cpf file in the cpf subdirectory you just created. the constant desired value that we constrain on the position determined with the previous property, in meters: 0.45.
starting the supervisors and timers to get everything running. Copy these files to the package you have created for this application. order is of importance! First tasks, then itasc_supervisor, then application_supervisor !! The template creates automatically an eventFirer, which is a component with ports connected to the event ports of the itasc- and application_supervisor. This allows easy firing events yourself at runtime, by writing an event on one of the ports. This section explains how to create the finite state machines that coordinate the behavior at runtime, which is already drawn in the section 'Draw the behavior of the application at runtime' above and explained in detail in 'subFSM's of the running state' of the iTaSC user guide. 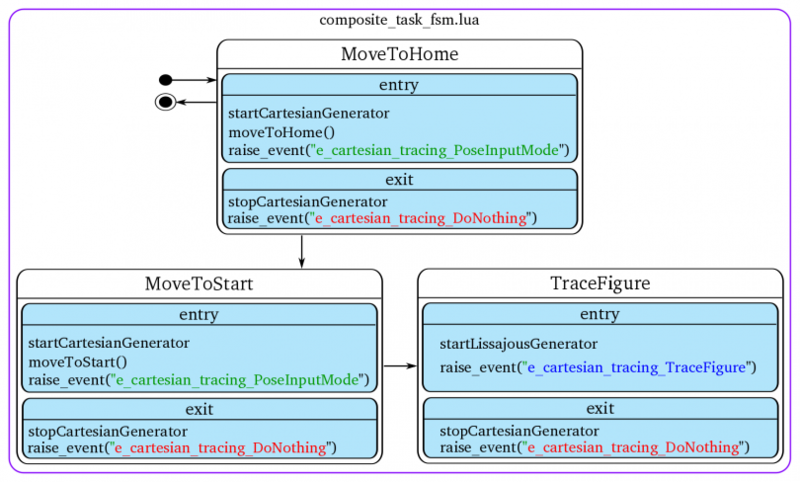 It consists in this application of the interaction of two state machines: composite_task_fsm.lua at the iTaSC level and running_cartesian_tracing_fsm.lua at the task level (only 1 task in this application). The idea is to put a function in the FSM and the implementation with the RTT specifics in the supervisor. Make sure the task FSM is reacting on the right events, send out by the composite_task_fsm. The section 'Create a deploy script' explains how to get the events from other state machines and components in your state machine. Start from the template composite_task_fsm.lua in the itasc_core package, scripts subdirectory. Copy this file to the scripts subdirectory of the package you have created for this application. Implement here the composite_task_fsm state machine as drawn above. In the figure is a bullet with a circle shown as a representation for the initial transition. In this case the initial transition shown in the figure is preceded by the obligatory 'initialize' and 'initialized' states, which are already present in the template. The event needed for the transition from the MoveToStart to the TraceFigure state, will be send out by the 'cartesian_generator'. Look in his code for the event name. 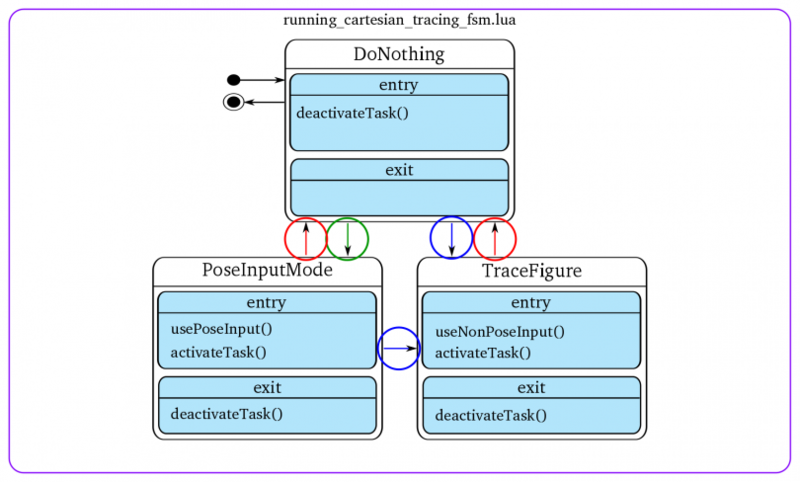 Edit the running_cartesian_tracing_fsm.lua that you have created in the section 'Create the FSM of the cartesian_tracing task' above. Implement here the running_cartesian_tracing_fsm state machine as drawn above. in youbot_test.lua configure your youbot type and network interface to which the youbot ethercat is connected. When your application has gone trough the configuration and starting phase, it will reach the running state: You should find a line on your screen saying "===Application up and running!==="
Where do I define my Virtual Kinematic Chain? Where do I put the feature coordinates in the code?